Whenever moving lights are installed outdoors – either permanently for architectural applications or during temporary events and festivals – protecting such sensitive equipment against the elements becomes essential. The Igloo was created by Clay Paky for exactly this purpose – a tough, sturdy enclosure that offers complete protection against rain and humidity, and maintains a perfect working temperature (between 0°C and 35°C) for fixtures even in hot or sub-zero conditions. The Igloo is great for permanent installations and is an indispensable tool for rental companies who want to protect their stock of lighting during outdoor events and festivals. Above all, the Igloo is quick to install, simple to use and competitively priced. •The Igloo dome is injection molded from UV-resistant transparent polycarbonate, and is carefully designed to ensure flawless projections without loss of light or image distortion. •The Igloo has been designed to accommodate any model of moving light from Clay Paky’s own Alpha 700, Alpha 300, Sharpy, Sharpy Wash and A.leda series – as well as automated fixtures of similar size, weight and consumption from other brands. 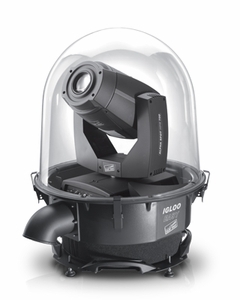 •For DMX512 fixture control, two options are available: either by using the IGLOO version with onboard wireless receiver (useful for remote locations) or by using the DMX wired version, with IN/OUT cables and waterproof glands, integrated into the base of the dome. •Power is supplied via two cables with cable glands: one for the dome internal devices, the other for the luminaire. •The Igloo is equipped with four carrying handles and offers the option of a flight case for safe transport. •Installation follows a quick, plug-and-play procedure requiring no tools or special skills. A mechanical multi-positional fixing system allows a variety of compatible luminaires to be fixed. Once sealed, internal electrical connection is done via the supplied Powercon socket, and an integrated XLR socket allows connection to the fixture's DMX interface. •The temperature inside the dome is regulated by an automatic cooling and heating system that maintains a constant operational temperature between 0°C and 35°C (32° F – 95° F). •The base is extremely shallow allowing the beam to point in any direction without being blocked or masked – even at maximum downward tilt. •The Igloo is entirely weatherproof, with each component offering IP54 protection. The locking system connecting the base to the dome is equipped with a watertight seal and fasteners; power and data cable glands are certified for outdoor use. And, a flexible mounting system allows the Igloo to be oriented in any position without compromising its high IP rating – either placed on the ground, hung upside-down or fixed to upright structures in a horizontal position.